The Vedic system of time division divides each day (from one sunrise to another) into 24 horas. These horas are further divided into ghati-vighati. Each hora is ruled by a planet starting from the lord planet of the day. The horas are auspicious for certain activities and inauspicious for others according to the nature of these planets. Planning the day according to the horas and avoiding unlucky activity during the connected hora reduces the chances of bad results. 5:32:39 AM 6:39:13 AM Moon Property, romance, ornaments, art. 6:39:13 AM 7:45:46 AM Saturn Labor, Iron, Oil. 7:45:46 AM 8:52:19 AM Jupiter Auspicious work, jobs, business, learning. 8:52:19 AM 9:58:53 AM Mars Agriculture, martial, engineering, adventure. 9:58:53 AM 11:5:26 AM Sun Politics, court, buying-selling, adventure. 11:5:26 AM 12:12:0 AM Venus Love, marriage, ornaments, entertainment, dance. 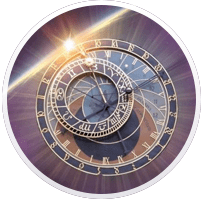 12:12:0 PM 13:18:33 PM Mercury Trade, medicine, learning, astrology, technology. 13:18:33 PM 14:25:6 PM Moon Property, romance, ornaments, art. 14:25:6 PM 15:31:40 PM Saturn Labor, Iron, Oil. 15:31:40 PM 16:38:13 PM Jupiter Auspicious work, jobs, business, learning. 16:38:13 PM 17:44:46 PM Mars Agriculture, martial, engineering, adventure. 18:51:20 PM 19:44:46 PM Venus Love, marriage, ornaments, entertainment, dance. 19:44:46 PM 20:38:13 PM Mercury Trade, medicine, learning, astrology, technology. 20:38:13 PM 21:31:40 PM Moon Property, romance, ornaments, art. 21:31:40 PM 22:25:6 PM Saturn Labor, Iron, Oil. 22:25:6 PM 23:18:33 PM Jupiter Auspicious work, jobs, business, learning. 23:18:33 PM 24:12:0 PM Mars Agriculture, martial, engineering, adventure. 0:11:59 AM 1:5:26 AM Sun Politics, court, buying-selling, adventure. 1:5:26 AM 1:58:53 AM Venus Love, marriage, ornaments, entertainment, dance. 1:58:53 AM 2:52:19 AM Mercury Trade, medicine, learning, astrology, technology. 2:52:19 AM 3:45:46 AM Moon Property, romance, ornaments, art. 3:45:46 AM 4:39:13 AM Saturn Labor, Iron, Oil. 4:39:13 AM 5:32:40 AM Jupiter Auspicious work, jobs, business, learning.